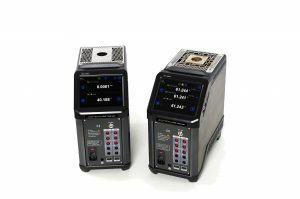 Zedflo along with Additel Corporation introduces their new ADT875 Dry Block Calibrator series. It consists of three temperature ranges from –40°C to 660°C. There are three ranges to choose from:–40C° to 155°C (ADT875-155), 33°C to 350°C (ADT875-350) and 33°C to 660°C (ADT875-660). Each unit has performance specifications related to the guidelines published in Euramet cg-13 specifying stability, radial and axial uniformity, loading, and hysteresis. All Dry Block Calibrator models have a process calibrator option. This combines many features found in a HART documenting process calibrator with the temperature dry block. This option includes the ability to measure a reference PRT and two channels for device under test, which can measure, mA, voltage, switch, RTD or thermocouple. In addition to these measurement functions, this calibrator has documenting capability. This allows creation of tasks, saving as found and as left results, and HART communication. The Additel 875 Series are now available for order. For more information, please visit www.zedflo.com.au. Additel Corporation is one of the leading worldwide providers of process calibration tools. Additel Corporation is dedicated to the design and manufacture of high-quality handheld test tools and portable calibrators for process industries in precision pressure calibration and test instrumentation. With more than 18 years in the industry, Additel has successfully developed Dry Block Calibrators, Pressure Controllers, Portable Automated Pressure Calibrators, handheld Digital Pressure Calibrators, Documenting Process Calibrators, Multifunction Process Calibrators, Digital Pressure Gauges, and various Calibration and Test Pumps.